Boiledbeans » I see your tin foil hats and I raise you this.. I see your tin foil hats and I raise you this..
Goggles that block face detection algorithms from working. Sweet! 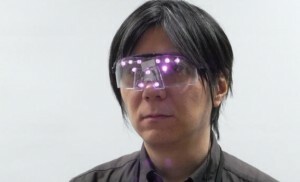 Privacy visor, used to block facial recognition applications. Privacy Visor, to block Face recognition. Goggles that Fool Face Recognition software developed by Isao Echizen of Tokyo’s National Institute of Informatics, japan.